On your arrival at New Delhi airport meet our tour representative and get transferred to your pre- booked hotel. The capital city of India welcomes all the tourists with a number of attractions and heritage sites which form a major part of Indian tourism. Delhi is majorly known for its street food and fine-quality restaurants which attracts a lot of food lovers and other tourists to the destination. Even if you are planning your first trip, the city will surely not disappoint you in any way. The city offers something for every traveler. Enjoy breakfast and proceed to visit some of the important tourist places and major UNESCO sites of the country including Red Fort, Qutub Minar and Humayun’s Tomb. As the name suggests, Red Fort (closed on Mondays) is a red sand stone structure that paints a picture of Mughal era in India. Red Fort is the place from where the Prime Minister of India addresses the nation every year on the occasion of Independence Day (15 August). The star attraction of the monument is the sound and light show which tells about the history of Mughal era in the evenings. Qutub Minar is another prime attraction, we take you to. Built by Qutub-ud-din-Aibak in 1192, it is one of the finest and tallest minarets in the world. It is a monument that signifies the might of Islam. Also, you visit the Humayun’s Tomb, which was originally commissioned by Humayun’s first wife, Bega Begum. The first garden tomb of India, Humayun’s Tomb speaks much about the decline of the Mughal era and rise of British Empire during those times. Get back to the hotel for overnight stay. Today, have breakfast and leave for Haridwar, one the holy Hindu cities of Uttarakhand. Haridwar is one of the seven holiest places for Hindus. It is the first place where the holy river Ganga enters into the Northern plains. People from all over the world visit the destination to take a dip in the holy waters of the river, which is believed to wash away the sins of every individual. Haridwar is also one of the four cities where Kumbh Mel air organized. Check-in at the hotel. Relax for some time in the hotel room. Later, in the evening visit Har-ki-Pauri, a holy Ghat on river Ganga, for Ganga Arti (river worship ceremony). It is going to be a memorable experience. Treat your eyes to the mesmerizing view of the shadow of the lamps falling in the water of the river. 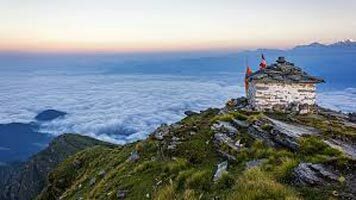 On third day of your Auli Skiing tour, savor breakfast and drive to Joshimath. On your way to Joshimath visit Devprayag, Rudraprayag and Karnprayag. 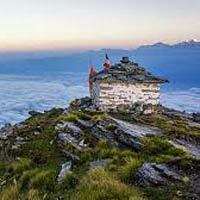 Also referred to as Jyotirmath, Joshimath is the gateway to one of the sacred pilgrimage sites, Badrinath. Devprayag (confluence of two holy rivers- Bhagirathi and Aalknanada), Rudraprayag (Alaknanda meets Mandakini) and Karnpryag (Alaknanda is joined by Pinda river) are the three extremely popular, out of Panch Prayags. Munch some healthy breakfast in the morning and then leave for a sightseeing tour of Rishikesh. Begin with a visit to Ram Jhulla and Laxman Jhulla- 2 popular suspension bridges over river Ganges; Sivananda Ashram- soak the serenity and simple lifestyle lead here; Triveni Ghat- the confluence of 3 holy rivers Ganga, Yamuna and Saraswati; Parmarth Niketan- a world-popular Ashram and Gita Kutir- another ashram popular for its meditation sessions. Later, start driving to Delhi. You will be transferred to the airport/railway station for further departure.